Dawn of Gods is a new strategic base-building game by Aeria Games, that was released last month for iOS devices. 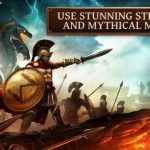 What makes this game interesting is the fact that you aren’t merely limited to the gods and goddesses of one culture – you will be controlling Greek gods like Zeus, Norse gods like Odin, and Egyptian gods like Ra, to name a few. The game supposedly includes hundreds of gods to control (or over 150, as shown on the features list), as well as a distinct social element where you can form a guild and challenge players from all over the world. 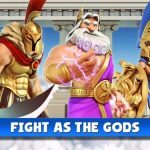 You can upgrade your gods and evolve them, make use of different base-building options, and take part in six different battle modes. Considering all those ancient gods you can control in the game, as well as the various features on top of the ones we mentioned above, it can take a while to learn how to play Dawn of Gods. 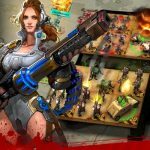 But we’ll get you started if you’re playing the game for the first time, with a few Dawn of Gods tips, cheats and tricks designed for beginner players. From the get-go, you should be focused on building structures for your base. It’s going to be a long process before your base becomes something worth writing home about, so you will want to start that building as early as possible. Saving your resources may seem like an instinctive thing to do, but it won’t be very practical when you’re dealing with build timers. It could be anywhere from a few minutes to several hours, but as long as you’re playing this game at least once a day, you’ll be eligible for daily rewards. The dailies can be quite attractive, and you can also make good use of the free summons; these allow you a good chance at getting rare items and/or new gods, which are otherwise available through premium currency. You can also get rewards from quests, which are more like milestones that you’ll organically reach as you play the game. 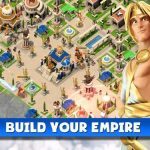 One general rule to follow when it comes to building stuff in Dawn of Gods is to build your new structures and upgrade existing ones starting from the cheapest, and to work your way toward the most expensive. This is in opposition to focusing all your resources on one structure alone. Doing this allows you to properly balance your resources, and also saves you some valuable time; cheaper structures take less time to build, while initial upgrades are completed faster too! Before unleashing your gods and your troops on the battlefield, you should make sure to scout the area and see what’s ahead of you. After you deploy your troops and gods, you wouldn’t be able to control them anymore, and you’ll only be wasting your time if you deploy them in well-defended areas. Have them attack where an enemy is most valuable, and have them take out their defensive structures. And while this should be obvious, you should also be sure you’ve got enough troops, and training the ones you’ve got. This would be our collection of tips and tricks for Dawn of Gods. Stay tuned, as we may update this guide with more hints in the near future!